Exclusive 12, 8, 5 or 3 Easy Payments on JBL 305 MKII Studio Monitor And PreSonus AudioBox 96 Recording Bundle only at AMS! Free 2 Day Shipping and Free Extended Warranty. Call our Gear Experts at 800-319-9043 for expert advice! Offering simple and easy mixing, you can record your music with confidence and accuracy. The PreSonus studio quality interface works with your software and then you listen to your final cut through a studio staple, JBL monitors. I am always dreaming of own a studio. As a beginner, I am so happy to pick the right products. It’s so affordable and it works way better than i expected. I am recommending this product to anyone that looking to make their dreams in this music world comes true. I’ve bought the package twice! Gave the first one to a friend and bought myself another! It comes with Studio One along with some extra dope plug ins. The mic quality is insane. I only wish it came with extra cables for the nano patch but I bought some guitar pedal connector cables and works just fine. Other than that its great for everything it comes with. My favorite is the JBL speakers. I know the value alone is about $4-$600 depending where you buy them. The audio box is compatable with both PC & Mac with no problems. I’ve used it with both studio One 3 and Logic Pro X. This was a great christmas present for my grandson,he can't stay away from it. I find this product to be well worth purchasing and we love the payment plan. this was the best deal ever.... and the equipment is fabulous for a first time studio owner.. So the DAW sent with this is a watered down version? My first home studio, Perfect bundle! All I needed to set up my home recording studio on a small budget! The durability of the product seems great! Good bang for my buck. Everything came on time. Quality is great. No complaints at this current time. I've been a musician my whole life and I have to say studio one is fantastic. 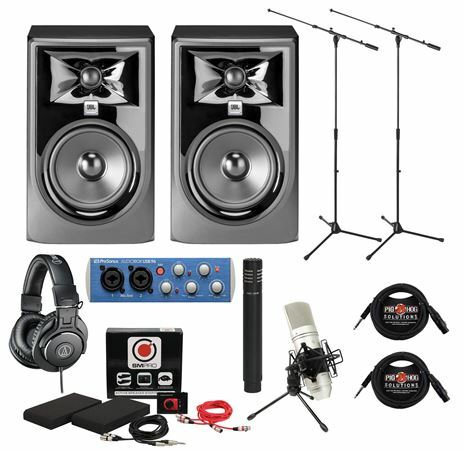 I bought this bundle and it has done wonders for my home studio I wouldnt pass it up. If you are a musician at home you should buy this product.